Location: Lake Seliger, Tver Oblast, Russia. Notes: The island is the home of Nilov Monastery, which was founded by Saint Nilus in 1594, and previously welcomed up to 40,000 pilgrims each year. Most of the buildings of the monastery were built in the 18th and 19th Centuries in a neoclassical style. Today the monastery complex remains one of the most impressive ensembles of Neoclassical architecture in Eastern Europe. Some of its churches date back to the 17th century. A graceful embankment was completed by 1812, and a large cathedral was built in 1821-25. The construction of the causeway to the island was completed in 1812. 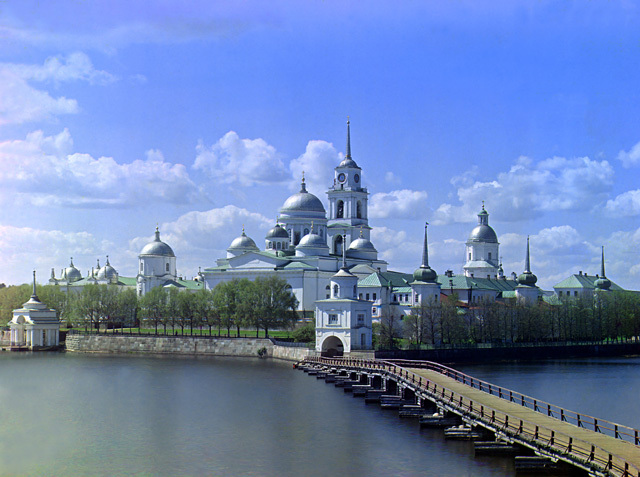 The Nilow Monastery was one of the largest and wealthiest monasteries in the Russian Empire.